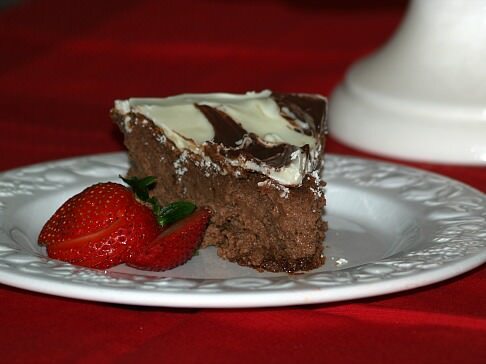 Don't you just love knowing how to make plain cheesecake recipes? The rich creamy cheese filling is what it is all about for some. They want nothing to distract from this luscious taste; no fruit, no glaze, no frosting, nothing but that delectable flavor. 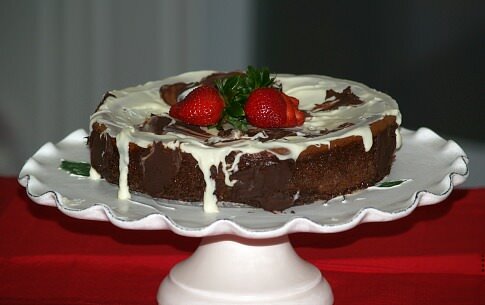 Most plain cheesecakes are baked but there are no bake recipes also. Most of my recipes do have a crust to them but there are ones which are without crust. 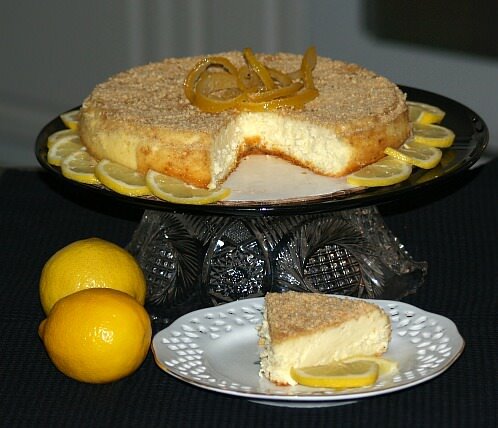 Many consider these plain cheesecake recipes to be only white (or vanilla) ones. Because there are so many recipes with cookies, cake, nuts, caramels and various topping recipes, I consider “plain” to be basic. A plain or basic cheesecake could be a solid chocolate, solid lemon, solid vanilla, etc; just as long as it doesn’t include fancy toppings distracting from the basic dessert. I would also consider the key lime cheesecake recipe a plain one; but I would not marble it or have any toppings on it. Believe me the flavor of this one does not need anything with it. When learning how to make these plain cheesecake recipes, you might think the presentation to be also “plain”. Although the spring form pan produces a beautifully shaped cake and it is easy to serve from the bottom of the pan, you might want to dress up these cheesecake recipes a little for company. This is easy to do! Choose a pretty cake plate to arrange them on. Fold wide strips of duck tape in loops with the sticky side out. By placing this tape on the dish and then setting the cheesecake on top it will hold the cake in place. Pretty brightly colored paper doilies arranged around the cake help to make a pretty presentation. A small dollop of whipped cream on top of these plain cheesecake recipes, like the New York cheesecake recipe will add a special touch. Then add a maraschino cherry on top or a freshly sliced fan strawberry. A small decoration like this adds color and a special touch without interfering with that simple creamy delicious flavor. Small bowls of various fruit toppings arranged with the cheesecake might be welcomed by some of your guests and also add color to the presentation. When you learn how to serve plain cheesecake recipes verses more elaborate ones it depends greatly on the occasion. When needing something very special, try the ultimate cheesecake recipe. This recipe is “fit for a king” or any great party. It isn’t as hard to make as you might think if you follow the directions step by step. You will find it is well worth the effort. The flavor of the Chambord and the presentation cannot be beat. Whichever you choose, the plain cheesecake recipes or one of the more elaborate ones like the amaretto cheesecake, you cannot go wrong serving cheesecake. This is the most demanded dessert all over the world. It is certainly a crowd pleaser! Wrap bottom and sides of 9 inch spring form pan with solid sheet of aluminum foil. Butter sides and bottom of pan; place graham cracker crumbs in the pan and shake until coated. Shake out excess crumbs and set pan aside. In large mixing bowl beat cream cheese on medium speed of mixer until smooth. Add sugar, eggs, heavy cream and lemon extract; beat until creamy. Pour mixture into prepared pan and smooth to make level. Place pan in a larger pan; pour hot water in larger pan ½ inch up sides of spring form pan. Remove cake from oven and cool to room temperature. 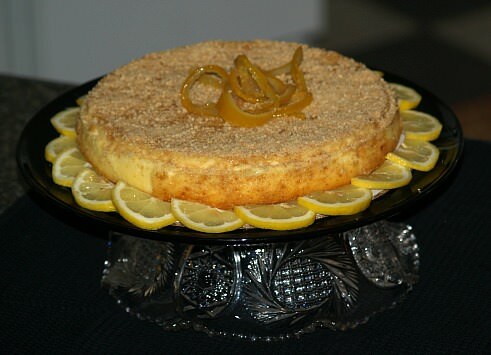 Turn cheesecake upside down on platter; refrigerate 6 to 8 hours until cold. Combine crumbs and melted butter; stir until moistened. Press into bottom of 9 inch spring form pan; bake 6 to 8 minutes. Bake 6 to 8 minutes; REDUCE OVEN TEMPERATURE TO 300F degrees. Place chocolate morsels over low heat stirring until melted and smooth. Gradually add sugar mixing well. Add eggs one at a time beating well after addition. Stir in cocoa powder, vanilla and melted chocolate; beat until blended. Stir in sour cream and blend well; pour into prepared crust. Bake at 300F degrees for 1 hour and 40 minutes. Run knife around edges to loosen cake from sides; DO NOT REMOVE SIDES. Set on wire rack to cool to room temperature; cover and chill at least 8 hours. Remove sides before serving; garnish as desired. NOTE: I used melted white and dark chocolate. This is one of the plain cheesecake recipes which requires no baking and is quick and easy to make. Combine crumb and melted butter; press into bottom and sides of 9 inch spring form pan. Refrigerate. Mix Jell-O in boiling water stirring until dissolved; chill until cooled. Combine cream cheese, sugar and vanilla; beat until smooth. Add cooled Jell-O to cream cheese mixture; blend well. Blend in whipped canned cream; pour mixture into prepared pan and refrigerate until set. Cream 2/3 cup sugar and cream cheese until smooth. Blend in vanilla; pour into heavily buttered 9 inch deep pie dish. Bake in preheated oven at 350F degrees for 25 minutes; remove from oven and prepare topping. Combine sour cream, 2 tablespoons sugar and vanilla; blend. Pour mixture evenly over top of cheesecake; bake for 5 minutes longer. Cool to room temperature; refrigerate 5 hours or overnight.